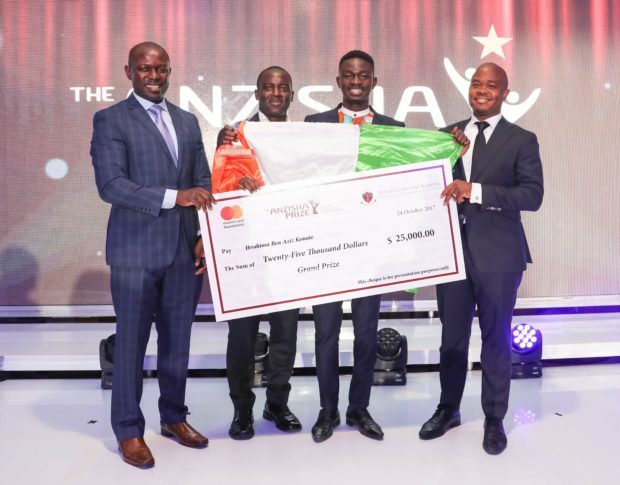 African Leadership Academy and Mastercard Foundation are pleased to announce that 22 year old, Ibrahima Ben Aziz Konate from Cote D’Ivoire has been awarded the top prize at the seventh annual Anzisha Prize awards gala. Ibrahima Ben Aziz is the founder of Poultry D’Or, a poultry business that often has over 500 sales a day and employs 15 people. Ibrahima was selected from a competitive pool of diverse entrepreneurs from 14 African countries. For the first time ever, Anzisha Prize is thrilled to award the grand prize to an applicant from Cote D’Ivoire. This will truly expand the reach and impact of the Anzisha program across various countries. “It is hard to believe that I was chosen as the winner of the prize. It has been a dream of mine to join the Anzisha Prize network since I first heard about it. The $25 000 is the difference that I need to scale my business and show the young people in my community that entrepreneurship is possible, even at a very young age,” says Ibrahima. Each prize winner has founded a business that responds directly to a social or economic need within their community. The two runner-ups were Edgar Edmund, 17, from Tanzania and Victoria Olimatunde, 15, from Nigeria. Edgar Edmund’s business Green Venture Tanzania has created a method of turning recycled plastic materials found on the streets into durable construction blocks. His long-term vision impressed the Pan-African panel of judges and his business model showed potential for making a significant and long-term impact. While Victoria, the founder of Bizkidz, a board game that teaches students financial literacy was chosen from 219 applications from her home country. In her presentation to the judges she demonstrated great leadership potential and a commitment to job creation. The winner of the Agriculture Sector Prize sponsored by the Louis Dreyfus Foundation was Ignatius Ahumuza from Uganda, founder of Art Planet Academy. Ignatius is already a role model proving that the agricultural sector can provide sustainable and fulfilling livelihoods for young people across Africa. Art Planet Academy’s purpose is to expand agricultural education across rural communities to increase farming skills and food security. This is an example of how a driven, industrious and energetic 21 year old can contribute to his or her country’s economic development. The Anzisha Prize is a partnership between African Leadership Academy and the Mastercard Foundation. The 15 Anzisha Prize finalists were selected from an applicant pool of more than 800 entrepreneurs from more than 32 African countries. The finalists and emerging business leaders were recognized at an exclusive, invitation-only ceremony on Tuesday 24 October 2017 in Johannesburg. The 15 finalists presented their ventures to a panel of judges after spending 10 days in a business accelerator camp to strengthen business fundamentals. They join a more than 70 strong pool of Anzisha Fellows and will receive ongoing business-consulting support, access to experts, and access to networking opportunities to enable sustainable venture growth. “Young African entrepreneurs such as the Anzisha Fellows are a testimony to the need for youth organizations to promote and provide continued guidance on entrepreneurship and self-employment for young people. Ibrahima is an example of how entrepreneurship and self-employment is key for achieving smart, sustainable and inclusive growth.” says Lerato Mdluli, Program Manager for the Anzisha Prize.